The 124 acre property known today as Mona Farm, dates back to 1836 when Thomas Braidwood Wilson, a Royal Navy surgeon settled in the district. In return for service Wilson was granted acreage, some of which he relinquished to create the township named Braidwood; Australia’s first heritage listed town. Wilson joined the Royal Navy as a Surgeon in 1815 making nine voyages from England, ferrying convicts to Australia. In 1829 on board The Governor Ready he became shipwrecked in the Torres Strait. He survived, with several crew, by rowing 1000 miles to Timor. In 1831, he sailed to Hobart on board The John, taking with him the first European honey bees brought to Australia. Wilson is also credited with the introduction of several valuable plants to Australia, including Laurustinus Viburnum Tinus and Lilac Aubrieta Adams, both still present today. In return for service to the Royal Navy, Wilson was granted acreage in Van Diemen's Land (Tasmania) in 1824, which he exchanged for 5,000 acres in the Southern Tablelands of NSW. 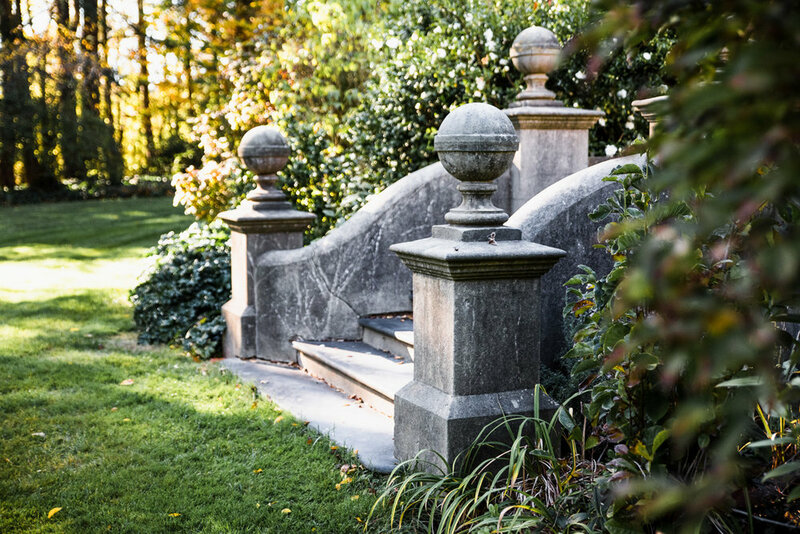 He purchased additional land to establish the 12,000 acre family property "Braidwood Farm" and began to establish the gardens with Scotch Firs, Oaks and Elms. He also introduced Horned Highland cattle. Wilson relinquished some of his land to create a township named Braidwood, in his honour (which in 2006 became Australia’s first heritage listed town). Wilson became a respected pastoralist and served as a magistrate, funding the building of the courthouse in Braidwood. The Wilsons had a third child, Thomas, in 1837, who died at the age of five months. His wife died not long after following complications during birth. During the drought and depression of the early 1840s Wilson was declared bankrupt and in 1843 he also passed away. All three are buried in a vault at the top of a hill just north of the town. Following Wilson’s death, Braidwood Farm was sold to John Coghill for 2,000 pounds. Coghill was captain of The Mangles, carrying Wilson on one of his nine voyages from England, and the two became friends. Coghill built the historic house, and now heritage listed Bedervale, at the end of Monkittee Street. John Coghill died in 1853 and Braidwood Farm was inherited by his daughter Elizabeth and her husband Robert Maddrell, who renamed the property Mona Farm. Robert had been born on the Isle of Man and Mona is Gaelic for Isle of Man. The Maddrells built a home for their flour miller on the Mona Creek junction. With the original homestead built by Thomas Braidwood Wilson having burnt down, this would become their family home in the 1860’s and today is the main homestead on the property. In 1859 the Maddrells built the original set of horse stables, which has since been converted into accommodation. In 1893 they built the long gravel carriageway and in 1903 the Coach House, which today has also been converted into accommodation. Robert Maddrell died in 1900 and took to his grave knowledge of the burial site of 3,000 gold sovereigns somewhere on the farm. The discovery of gold in the 1850’s had led to an era of bushrangers, and “safe storage” of valuable possessions was not unusual. Sadly, Robert died before communicating the all important location to his son, Henry Francis Maddrell, who inherited the property. Henry Francis embarked on a “grand design” converting the homestead into a 30 room mansion to accommodate his six children and servants. In 1901, to the disappointment of the local community, he destroyed an unfinished flour mill built by Thomas Braidwood Wilson so the bricks could be used on the homestead’s extension. Henry Francis also built the Shearing Shed, the Chapel, the Shearers Quarters, the School House and the Gardener’s Cottage. Henry Francis died in 1919 and left Mona Farm to his son Garnet. Garnet chose to keep his home in Sydney and sold down acreage until the Great Depression of 1929 lead him to sell the property in 1934 to Arthur E Wilson, the grandson of Thomas Braidwood Wilson. The Great Depression prompted Arthur Wilson to reduce Mona Farm’s operating costs by halving the size of the homestead and eradicated much of the garden. The magnificent elm trees, Victorian walls and entrance steps all survived. In 1947 Arthur Wilson sold Mona Farm to Janette and Jock Mackay. The Mackays added a new wing to the west of the existing house, built a tennis court and a walled garden and generally resurrected much of the garden. In 1995 the Mackays sold the property to Kerry and Greg Schneider who commenced extensive works as part of converting Mona Farm into a function centre with accommodation. These works included the New Stables, Mona Lake and the Palladian Bridge. In 2013 the property was purchased by Rose Deo whose love of horses saw the building of an Olympic sized Equestrian Centre. In 2018 Mona Farm was purchased by Belinda and Bill Pulver. Since this time, Mona Farm has undergone a sophisticated transformation with the installation throughout the estate of over 15 Australian and International sculptures, and one of the most significant contemporary art collections in Regional NSW. Stylish furnishings have brought a classic, contemporary edge to the historical farm house, accompanied by the thought provoking art. Once upgrades are complete, the property will house six standalone buildings each with its own unique story to tell through art and design. Thomas Braidwood Wilson joins the Royal Navy as a surgeon making nine voyages from England ferrying convicts to Australia. Wilson is granted acreage in Van Diemen’s Land (Tasmania), which he exchanges for 5,000 acres in the Southern Tablelands of NSW. He purchases additional land to establish the 12,000 acre family property, ‘Braidwood Farm’, now known as Mona Farm. Wilson establishes the gardens with Scotch Firs, Oaks & Elms and introduces Horned Highland Cattle. Wilson relinquishes some of his land to create a township named Braidwood, in his honour. Wilson became a respected pastoralist and served as a magistrate, funding the building of the courthouse in Braidwood. Wilson sails to Hobart to board the The John, taking with him the first European honey bees brought to Australia. Wilson settles in the Braidwood district. Braidwood Farm is sold to John Coghill, a friend and fellow voyager of Wilson. Coghill builds the historic house and now heritage listed, Bedervale, at the end of Monkittee Street. John Coghill passes away and Braidwood Farm is inherited by his daughter Elizabeth and husband Robert Maddrell. The Maddrells rename the property Mona Farm (Gaelic for Isle of Man). The Maddrells build a home for their flour miller on the Mona Creek junction, later to become their family home, and today, The Homestead on the property. The gold mining boom sees Chinese miners arrive in Braidwood and the greater region. The Maddrells build the original set of horse stables, now converted accommodation. The Maddrells create the long gravel carriageway. Robert Maddrell passes away and took to the grave knowledge of the burial site of 3000 gold sovereigns somewhere on the farm. Robert Madrell’s son, Henry Francis Maddrell inherits Mona Farm. Henry Francis embarks on a ‘grand design’ converting The Homestead into a 30 room mansion to accommodate his six children and servants. Henry Francis destroys the unfinished flour mill built by Thomas Braidwood Wilson so the bricks can be used on The Homestead’s extension. Henry Francis also builds the Wool Shed, the Chapel, the Shearers Quarters, the School House and the Gardener’s cottage. Henry Francis builds the Coach House, now converted accommodation. Henry Francis passes away, leaving Mona Farm to his son Garnet, who keeps Sydney home and sells down acreage. The Great Depression leads Garnet to sell the property to Arthur E Wilson, the grandson of Thomas Braidwood Wilson. The Great depression prompts Wilson to reduce Mona Farm’s operating costs by halving the size of the Homestead and eradicating much of the garden. The magnificent elm trees, Victorian walls and entrance steps all survive. Wilson sells Mona Farm to Janette and Jock Mackay who add a new wing to the west of the existing house, build a tennis court and generally resurrect much of the garden. The Mackays sell the property to Kerry & Greg Schneider. The Schneiders commence extensive works to convert Mona Farm into a function centre with accommodation. This includes the building of the New Stables, Mona Lake and the Palladian Bridge. Braidwood becomes Australia’s first heritage listed town. Rose Deo purchases the property and builds an Olympic sized Equestrian Centre. Mona Farm is purchased by Belinda and Bill Pulver who start plans to restore the estate and create a working farm.